One of perhaps the most memorable moments of the entire 2016 election cycle will end up being the parents of the late Captain Humayun Khan speaking out against Donald Trump's bigotry at the Democratic National Convention. Now, Khizr Khan has some questions for Donald Trump, and they bring into focus exactly what's wrong with Trump's whole campaign. The Khan family is the very personification of what it means to be American, and yet, as Khizr Khan points out, they have no place in Donald Trump's America. As Muslim immigrants to the U.S., Khan and his family already belonged to one of the groups that Trump has targeted the most often. In a true demonstration of his character, Trump then attacked them personally after Khizr Khan's moving speech at the Democratic National Convention, causing a big momentum shift towards Hillary Clinton. Seeing Trump go after a Gold Star family, a family whose child died serving hono in the American armed forces, came as a surprise even to those who thought at the time that he couldn't sink any lower. Now, on the very doorstep to Election Day, the Clinton campaign has called upon Khan to speak out against Trump again — and there are a lot of people listening. Khan took the stage at a Hillary Clinton rally in New Hampshire on Sunday, and his questions hit right to the core of what so many people are wondering. His remarks echo what Khan brought up last month in a Clinton campaign video. 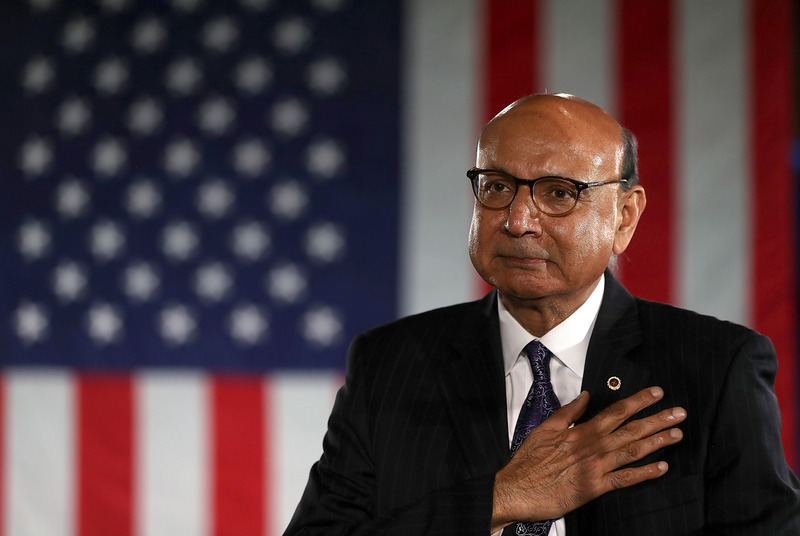 Would my son, Captain Humayun Khan, have a place in your America? Would Muslims have a place in your America? Would Latinos have a place in your America? Would African-Americans have a place in your America, Donald Trump? Would anyone who isn’t like you have a place in your America, Donald Trump? Trump, of course, has played on the basest of instincts: the instinct to be afraid of people who look different. As a nation of immigrants, though, the United States is based on the exact opposite principle. While the country has a stained history in so many ways and still has so many problems to struggle with and work out, it is at its most fundamental level a country made up of people from different places, and with different backgrounds, histories, and guiding philosophies. The Khans are far from alone as an immigrant family who came to the U.S. and then made the ultimate sacrifice for the country that they now call home, but they've come to speak for all the rest of those families in this election — the families that Donald Trump has left out. Donald Trump listened to Khizr Khan's words in the past, and they clearly got under his skin. One can only hope — pessimistically — that he was listening again on Sunday, and that he will take a minute to think about them.